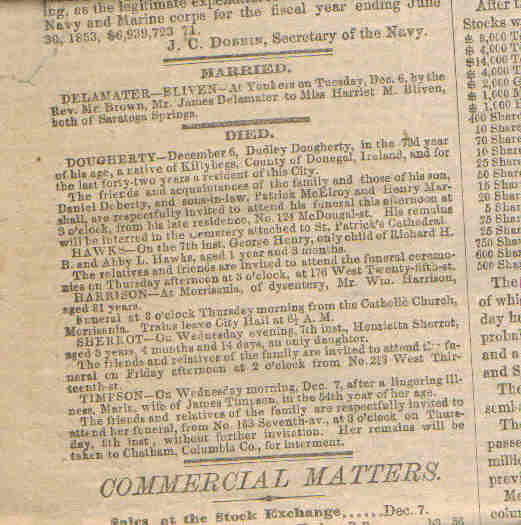 THE DATE LISTED BELOW IS THE DATE OF THE PAPER NOT THE DATE OF THE EVENT. PLEASE EMAIL ME FOR ADDITIONAL DETAILS, COPIES OF OBITS ETC. FREE. aka (1853nyobits) and date of paper and name of person, thanks. HENRIETTA GASCOIGNE. DR. HOLLY GREGORY. CHARLES E. MERRIAM & MRS. ELIZABETH PALMER & JAMES B. SMITH. GENERAL JAMES TALLMADGE, MARY COUTANT, MRS. ANN WELCH, ELIZA ANN, CATHARINE EMMA FINK, VICTOR ANTHONY LEON, PATRICK DEMPSEY, MRS. MARY CLANCY, MARGARET RIDNEY, WILLIAM SEAMNA, WILLIAM S. DUKE, ELIZA J. MORAN, THOMAS JP. SCOTT, ALMOND WILLIAMS , CHARLES G. CARLETON, MRS. MARY ANN DUNN, ABRAHAM MILER. JOHN HARPER, PATRICK DEMPSEY, MRS MARY CLANCY, WILIAM SEAMAN, DAVID A. PULLIS, HENRIETTA PALMER, JOHN BLAKELY, ELIZA J. MORAN, GEORGE STEERS, JAMES CLARK , WILLIAM FAGAN, ADELAIDE MC CREADY, JAMES THOMAS BRADY, HENRY CLAY BURGH, EDWIN SLY, THOMAS P. SCOTT, CLARA F. NICHOLS, JOSEPH S. HIXON. JAMES THOMAS BRADY, ADELIA MCCREADY, MRS. JANE SMITH, MRS. JOANNA WALSH, MINARD T. ADEE, ALLIENE BRUSH, CHARLES KING KERR, ELZABETH EDWARD LOUISE KNAPP, HARRIETTA S. ROBERTSON, JOSEPH S. HIXON, HANNAH GILESPIE. ANNIE C. PRICE, THEODORE MC GLOIN, DAVID A. PULLES, SARA SMITH GEORGE W. SCHOTT, WILLIAM O WARNER, CHRISTIAN R. TIPLER, GEORGE MEDAY , JOHN GREEN ABRAHAM EDWIN JOYNER, MRS. WILLIAINE SMITH, GEORGE A. BLOOD, EMELINE AUGUSTA MARSHALL, JAMES ENNIS. SARAH BENNET, REV. JAMES MCDONOUGH, MARTHA YATES, BENJAMIN BURTIS, FREDERICK AUGUTUS THOMPSON, ELIZABETH B. WHEEL WRIGHT. JOHN ROBERT RENALL, VERONICA SHEIL, THOMAS H. KELLY . HON. ELIJAH H. PAINE, MRS. JANE E.W. BANTA, PHILLIP PITTALUGA, BRIDGET O'NEIL,CHARLES WHITE,THOMAS FULLER POTTER, KATE STUART. WILLIAM BRAGG, ELIZA PERRY, ALEXANDER JENKINS, MAGARET BRUCE, JACOB H. STREVER, MARY JANE MC ATEER, JOSEPH H. STUCKEY, WILLIAM VAN EMBURGH, FAMMY MOORE, MINIE DAYTON. HON. ELIJAH PAINE, CYRUS S. CURTIS, LORETTA A. SKIDMORE, ELIZA COWENHOVEN, MR. JOHN BRADY, JOHN C. ALWENS, NORMAN B. GRIFFITH, MRS. MC ARDLE, WILLIAM P. CHAPMAN, GEORGE STANLEY, ABRAHAM. BEITTMAN, KATE STUART BAKER, THOMAS P. GREEN, AGNES M. ANDERSON, ESTELLE VICTORIE, MARTHA VAN DE BEEK,SAMUEL MANN. ALICE MANNING, MICHAEL DEMEREST, HUSBAND & WIFE CHARLES & JEANETTE TURNER. FRANCIS BRAMHALL, BARTHOLOMEW ROONEY, WILLIAM P. ELDER, LUCIA GERTRUDE GEER, MRS. ANN CAROLINE FOSTER, SARAH FRANCIS BENNETT, MARTHA PHILLIPS. HANNAH H. VAN IDERSTINE, PRUDENCE ANDREWS EMMONS, ELLEN DOYLE SCANLAN, WILLIAM YOUNG WILLIAM SHURRICK WARE, JAMES R. MC DONALD, NATHANIEL SMITH SR. CORNELIUS TRIHUNE, MRS. H. CORNELIUS COSGROVE. ESTELLE VICTORIE EAUCHOLS REYLINGS, REUBEN C. HALLETT. STEPHEN HENRY, MRS. CATHARINE RAHN, JAMES STODDART, ACTATUS MC ARDLE, WILLIAM MAXWELL, MRS. JOSEPHINE SOPHIA SEARS, JOHN WRIGHT, JOHN CARR, RACHEL VAN SAUN. ENOCH MORGAN, MRS. MARTHA WRIGHT, CHARLES MOORE, PHILLIP WERNER, MARY ANN SHEPPARD, ELIZABETH C. WESTERVELT, ELIZA BULLWINKLE, MARY HANSON THOMAS, BRIDGET GILROY, DR. BENJAMIN MARSHALL WILLIAM ANDREW MARCH, PHILLIP D. MCC CARTHY, SUSAN GERTRUDE, ABRAHAM. M. BOYD. DAVID J. BERDAN, MARIA E. MERRITT, EMILY IRVING , DANIEL BAKER, ISAC DEVOE, MARY DAY, DR. BENJMAIN MARSHALL THOMAS HOPPER COOPER. ANNA LOUISA MILLS, LEVI PAGE, MARY RYAN, ANNE O'BRIEN, EMILY B. TREAT, FRANCIS CAPARE, JOSEPH CANNINI, EDWARD CUSACK TIGHE, ABRAHAM H. BANTA, BRIDGET KIERNAN, HENRY DRAKE, FRANCIS LACKEY,ANN COYULE IDA ISABELLA KELSEY, DANIEL WHITTAKER. HENRIETTA MILLS, MARY SMITH, MARY LUYSTER, HANNAH LINDSAY, HENRY MELINS, MRS. LUCY DRAKE, JOHN D. ANDERSON, FRANCIS LOUISA GILMORE, MRS. LUCY VAN ORDEN, GEORGIANNA VAN ZANDT, MARGARET EGAN, EDWARD QUIRK MC GAREY. HENRY J. MEGAREY, MRS. H. M RITTER BUND, EUGENIA C. BOARDUS, JOHN V. REDENBURGH. ROBERT C. CHANDLER, GILBERT GILLESPIE, ARTHUR O'DONNELL.